Will banking resurrect its reputation? I imagine most readers will instantly snap: “No!” They’re probably right, but some of the language used recently by Antony Jenkins, Barclays’ new chief executive, and his counterparts over at Deutsche Bank, makes me think that it’s not a bad outside bet. He’s thinking long-term and he’s thinking about reputation. Andrew Hill over at the FT points out that Jenkins isn’t the first bank chief executive to trot out this kind of language, although Citigroup’s Chuck Prince wasn’t battling the kind of heavy regulatory onslaught today’s banking leaders are. 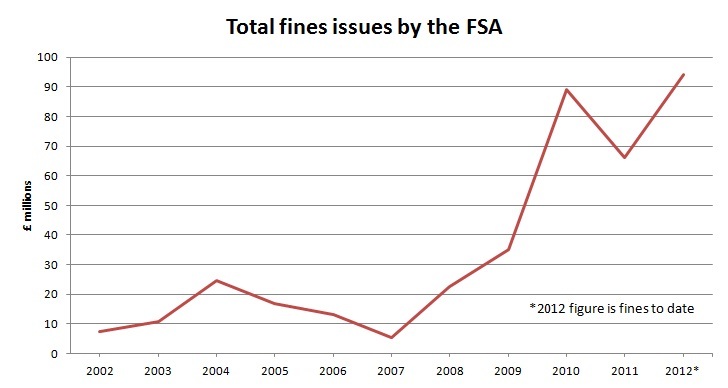 In a previous post, I noted the increase in the level of fines the FSA is levying; I’ve updated the chart to include the 2011 and 2012 figures. It quite starkly demonstrates how much more muscular the FSA is being in its role. Moreover, we know the FSA isn’t issuing fines at anything near the levels its US counterparts are. So, with a hardening regulatory environment, increasing political scrutiny and a raft of new global, regional and national regulation and legislation heading its way, I think it’s a safe bet that these new attempts to address reputational issues might succeed.